Have you been taking your car to the dealership? If you’ve been taking your vehicle to the dealership for maintenance and repairs instead of a local auto repair shop you are overpaying. A dealership will tell you they have better equipment, mechanics trained in their specific vehicles, and only use OEM parts. Two aspects of that claim are true, and neither of them matter. Auto shops all use a variety of equipment geared towards specific manufacturers vehicles. The diagnostic equipment used isn’t a fraction as important as the mechanic interpreting the data. Do specific training and OEM parts even matter? Even if you take your car to a dealership, there is no guarantee their mechanics completed vehicle specific training. There is no prerequisite for hiring a mechanic at a dealership. Just like an independent shop, they base hiring decisions on a number of factors. The largest factor by far is overall experience. A great mechanic is a great mechanic. Though there are idiosyncracies between vehicle systems and manufacturers, a mechanic learns these over time. 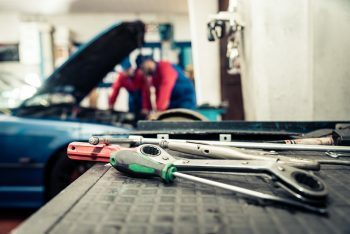 A reliable auto repair shop hires the right mechanics and fills in knowledge gaps as they go along. Because vehicle repair is a cross-manufacturer discipline, skills carry over. Why pay more at a dealership for the same level of mechanical training? OEM stands for original equipment manufacturer. That is all that it means. OEM parts are typically more expensive, but that doesn’t make them the best parts available. Many aftermarket parts are constructed with better materials and offer longer warranties. An independent mechanic typically provides you with several options. Depending on what’s being repaired you can choose whether or not to use OEM. Some non-OEM parts have fitting problems or an inferior build. That’s determined by the maker, though. An independent mechanic will use non-OEM parts that meet or even exceed your manufacturer specifications. These are just as reliable and perform as well or better than OEM parts. Why pay more when you don’t need to? You are legally allowed to choose your mechanic and car parts. Dealerships used to have a stranglehold on the auto repair industry. You had to take your car to them or it would violate your warranty. That isn’t the case today. You can legally take your vehicle to any mechanic you want. This ensures a competitive marketplace. It also means you don’t have to worry about your warranty being affected. A manufacturer cannot restrict your warranty based on the parts you use either. So what is the dealership charging extra for? Because they can. A dealership uses false claims of superior service in order to scare customers into sticking with them. You are paying an additional branding cost, additional OEM parts cost, and all for repairs, maintenance, and service that isn’t guaranteed to be any better than an independent auto shop. The only guarantee you can be sure of at the dealership is higher prices. Now you need to know what you can do about it. The best option is to vet your auto repair shop before you take your vehicle in. This can give you the peace of mind you’re looking for. The vast majority of auto repair shops warranty their work. This is true for independents and dealerships. They are competing for your business, which pushes both to be better. Well, an independent can justify their pricing structure, you’ll be hard pressed to find a dealership that can.